Founded in 2006 Paul McAneary Architects is an award-winning London-based architectural practice engaged in designing a range of residential, retail and cultural projects. Known for a spirit of elegantly refined minimalism, Paul McAneary Architects has a proven track record of devising innovative and environmentally sustainable architecture and interiors in response to often challenging sites and budgets. In particular, the idea of substance is crucial to the work of Paul McAneary Architects. In its most obvious manifestation substance speaks of physical materiality and the tactile quality of architecture – what things are made of and how they are put together. It also alludes to a rigour underscoring the ideas behind the design of buildings, as well as their construction and their capacity to endure in the long term. This is embodied in an ethos of ‘warm minimalism’, which responds to current environmental concerns by employing natural, carbon-neutral materials in a coherent, clean-lined and contemporary way. Inspired by a spirit of enquiry and economy, the practice cultivates an exploratory approach to detailing and fabrication, based on its own unique culture of research and experimentation. Over the years, it has established close working relationships with skilled craftsmen such as stonemasons, joiners and glaziers to achieve the best possible quality of workmanship. Built projects vary in size and scale. They include a £12 million restoration of a six storey townhouse in South Kensington, an elegantly restored art gallery in Mayfair and a beach house in Carmel, California. Its expanding portfolio currently includes work in the UK, predominantly in London, as well as France, Germany, Nigeria and the USA. In each case, the aim is to optimise the potential of the programme and budget in order to achieve exceptional outcomes for clients. Paul McAneary was born in Northern Ireland in 1973 and began his architectural education at the Oxford School of Architecture. While studying for his degree, he was awarded the Alan Barnes Travelling Scholarship which enabled him to undertake his practical training year in Hong Kong. Paul thrived in the fast paced environment of Hong Kong and was appointed project architect for a wide range of schemes while working for Mike Tonkin. Paul then moved to Tokyo to work with Shin Takamatsu, the noted Japanese contemporary architect. During his time in Japan he was drawn to its aesthetic culture of refinement and rigour. In particular, how light is captured and how materials can improve with age, relating to the concept of wabi-sabi. He completed his architectural training at London’s Architectural Association, studying under luminaries such as Ben van Berkel, Kevin Rhowbotham and David Green. After his time at the AA he was elected Honorary Secretary of the AA Council. In 2003 he qualified as an architect and worked for the influential minimalist architect John Pawson, completing a number of high profile national and international projects. On leaving Pawson he established Harwood McAneary in partnership with Australian architect Robert Harwood. In 2007 he founded Paul McAneary Architects, currently based in the centre of London (Soho/Covent Garden) in one of his own projects. It now houses a drawing atelier, exhibition space and workshop, with experimental design details that underscore the practice’s ‘warm minimalist’ approach. 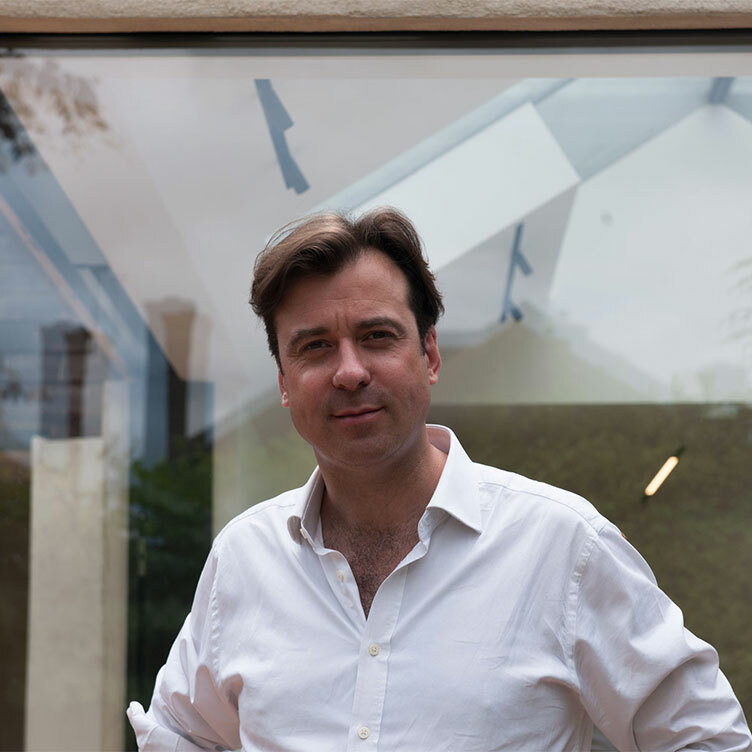 Paul McAneary Architects is now a thriving, medium-sized practice with considerable experience of working in London and overseas. Paul regularly holds lectures for his peers on his architectural ethos at venues and events which have included the ICA and Ecobuild. Paul McAneary Architects is currently seeking a Personal Assistant & PR professional to join its team in London. This is a multi-faceted role, which will be assisting the managing director on a wide range of ad-hoc tasks, including admin, relations with press and clients and coordinating the practice’s publications, graphics, website and social media. This role would suit a recent graduate or someone starting a career in the design world.The successful candidate must be an extremely organised and cheerful-natured person, with an ability to meet deadlines under pressure. Any candidate must have impeccable English language communication skills, both spoken and written. With this in mind please make clear your relevant experience and attributes in your application. The contract is for a full-time position and remuneration will be commensurate with experience and ability. It is preferred that the applicant should be available to start immediately. This is an all round role, where no two days will be the same. The position would suit someone who is organised, can keep to deadlines and work independently when necessary. Application deadline: the intent is to recruit the right person as soon as possible, interviews are scheduled to start as soon as candidates are available. Please send applications by email to for the attention of Paul. Experience producing tender and construction drawing packages. Comprehensive understanding of UK building regulations. Comprehensive understanding and experience of the planning process. The ability to manage projects from planning to completion. Excellent written and spoken English. Proficient in using 3D Vectorworks is advantageous. Technical detailing skills. Please make clear on you application the number of years UK experience in: residential, hotel, student, public, modular, others etc. The practice has offered internships to suitable candidates for the last 10 years. Interns are given full experience of all parts of architectural and interior design practice, from surveys to general arrangement drawings through to research and detailed design for construction as well as client and site meetings where appropriate at the time. Whilst the internship is unpaid, all interns leave trained to a high-level at the companies cost. As with previous interns, we recommend a minimum of three months offers the broadest of experience and the greatest value. The max duration is 6 months. The best interns have previously been offered full-time positions. We are currently seeking applicants for a number of positions at the office. For more information, please find them listed. Paul McAneary Architects is an equal opportunities employer. We regret that, due to the volume of applications received, we are unable to respond to unsuccessful candidates or return hard copy submissions. Scholarship Paul wins Alan Barnes Architectural Scholarship. Degree Paul commences architectural education at the Oxford School of Architecture. Hong Kong Paul in Hong Kong working for Mike Tonkin Architects. AA Diploma Paul Graduates from the Architectural Association School of Architecture. Paul is elected to the Architectural Association Council. Three years later he becomes the Honorary Secretary of the AA Council. John Pawson Paul in London working for John Pawson. Lecture 1 Love, Hate, Doing; ICA (Institute of Contemporary Arts), London. Lecture 2 ‘Love, Hate, Doing’ at Black Box, Belfast. Harwood McAneary Ltd Paul leaves John Pawson to setup in partnership with Austrailian architect Robert Harwood Forming Harwood McAneary Ltd.
Paul McAneary Architects Ltd Established April in Kingly Street, Soho London. PMA Font PMA designed and produced a truly minimal typeface by reducing characters to the list number of strokes, the least number of formal endings and by removing all unnecessary embellishments or serifs. PMA use this font at different scales and weights in all their buildings and interiors and all graphic presentations including this timeline. White Stair House One of PMA’s first residential projects laying the foundations of PMA’s design philosophy: Minimal design, clean lines, natural light and warm natural materials. Loophouse 1 A design precedent for PMA. First project to include PMA storage walls and the loop plan – forcing non-linear movements that encourages fluidity and efficiency of use. First Restoration Project Including a contemporary extension and modernisation of the listed modernist villa in Chiswick. First bespoke lighting detail developed. PMA Concept Kitchen commenced An ever evolving bespoke kitchen design – that responds to minimal hyper-functionality with hidden ergonomics, making the use of the kitchen a tectonic delight. PMA Skyshower Almost every PMA project contains a sky shower. This monolithic shower has a dramatic shaft of light from a skylight above. All visible drains have been removed for a completely pure form by floating the stone on a purpose made stainless steel frame. 15° Off-White House PMA’s first front cover for the development of its first light enhancing facet into this open plan project with ‘floating’ staircase. Faceted House 1 Developed several design cues influencing later projects namely – the facade’s twist to the south and the folded glass to skylight – both filling the space with light. Glulam House A new-build house made from pre-fabricated, glue laminated douglas fir faced panels. Model Home A House for Germany’s number 1 top model. Including a large walk-in-wardrobe room with bespoke PMA dressing chaise-longue. Loop house 2 Full refurbishment and modernisation of this 3 storey house including 3 new bespoke bathrooms and kitchen design plus interiors throughout. Competition Winner ‘BD Dyson Airblade Washroom Competition 2010’. Applying eco design and form and functionality to a commercial context. Award Winner The ‘Living Space Design of the Year’ at the Design Awards 2010 with Faceted House 1. Virus House A vast skin laying over the original structure allows for deconstruction and total remodeling of the inside, a whole new building is created for the Systemtec anti-virus company. A functional environment replaces the dated, ineffective design the company had outgrown. Though unbuilt, this design illustrates that a tensile skin overlaid, frees up the traditional limitations from a load bearing structure; facilitating expansion and flexibility for this software house. Exhibition Don’t Move. Improve! Faceted House 1 for NLA (New London Architecture), London. Glass House As featured in the Wall Street Journal. Situated in Shad-Thames, this converted mill house offers a large loft space usually unattainable in Central London. The client, who read History of Art at Cambridge, wanted the space to showcase his collection of contemporary art, including pieces from Damien Hirst to Harland Miller. He also requested to create privacy and intimacy within this ballroom-esque loft. Paul designed a dramatic, sophisticated scheme that worked with the existing elements of the space but incorporated interventions in many different forms of glass to emphasise, amplify and adapt this fantastic old mill house into a monochrome minimal wonder. Large panels of Smart Glass were used throughout the apartment in order to create visual connections between spaces separated by an atrium and to enable the users to instantly create a more intimate private setting by switching any glass surface from clear to opaque finish. Institute of Contemporary Arts Creating 3 glazed structures on the facade of this grade I listed Nash building at the Royal Mall on the drive to Buckingham Palace. Essential to the brief was that the structures be demountable and structurally integral so that they were self supporting without any connection to the parent building made the design of this detail extremely demanding. PMA Couch Board In tandem with architectural design concepts, PMA have developed numerous pieces of product design. Here is the sofa called the “couch board”, this is a piece of furniture that changes its form as its user changes the programme. It has a desk behind that can fold up or down, and side arms that fold out like an aeroplane’s armtray tables. Kostyal Gallery PMA have restored this Grade II listed property, into a hyper functional gallery space, maintaining the marked Georgian features and removing the late 20th century interventions. PMA designed a highly versatile bespoke lighting system and art library. Hovering House The thick beams contrast the delicate concealed frameless glass to brick detail connection between the new extension and the existing house, a bespoke PMA detail.The differential movements of these two contrasting materials and the challenge of making the connection water tight, made the design of this detail particularly testing. Lecture School of Architecture, Izmir, University, Turkey. Chariot Oil & Gas Ltd The commission for a mining company office allowed experimentation with stone finishing techniques in order to create the centre piece of the stone strata installation. Award Winner For ‘Living Space Design of the Year’ at the Design Awards 2011 with Tex-tonic House 1 and first Australian front cover. All Glass Bar The bar area was designed to be as transparent as possible. It is made entirely of UV bonded glass, there are no steel connections; a spectacular showpiece during entertaining. The only non glass element is a single spout mixer and waste column. Behind the shelves a glowing wall emphasises the visibility through every element and creates warm, colourful patterns as the light shines through the liquor and bottles. PMA Light Screen Serves as a room divider or concealed lighting element. This simple eco design provides illumination by low power LED behind a painted recycled compressed paper screen. Pop House A house for a X Factor judge and British singer song/writer. Oblong House Spans over 7 floors including 7 bedrooms and bathrooms, a spa, wine cellar, sky-cinema room, library, glass lift, full tree section, glass bar and hundreds of intricate bespoke details. It is PMA’s most titanic residential restoration project. Bespoke details and pushing boundaries were key to creating a dark contemporary twist on modern minimal architecture. The renovation respects historic elements of the London townhouse adding new elegant features that stand the test of time.PMA used the spectacular height and layering of the building to develop a concept that separated functions of the house into a hierarchy containing the users program at specific points. These separate layers are then united by a series of oblong features, from a minimal glass lift shaft to an oblong, back lit, polished glass installation floating in the entrance area. Eco-finity Spath & Screen Spa-th PMA conceive 2 new designs for Kaldewei: ‘Eco-finity Spa-th and Eco-finity Screen Spa-th’. PMA have taken bath design to the next generation of exclusive well-being experience at home. These baths are a combination of elegance, ergonomic functionality, luxury experience and sustainability. Tex-Tonic House 1 & 2 The clients brief in this invited competition was to design two apartments on the top floor of the existing Central London post office and Phillips de Pury art auction house in Victoria, London. Paul McAneary Architects’ response won the competition with a proposal for expressed natural tectonics through numerous new details, and even developing a new material type – of cast timber bronze. The overall architectural language is modest and dramatic at the same time: mixed timber tectonics have been applied with an emphasis on their texture and intrinsic beauty. The amount of ‘vertical natural light’ flooding through the large skylights, walk on glass and the horizontal curtain walling maximise the exquisite effect of the natural grain and pattern of the timber ceiling, oak beams and floor as well as the bronze ‘timber texture’. PMA Basin Inspired by the Japanese concept of Tsukubai, PMA developed a bespoke and naturally tectonic stone basin. Made from semi-porous travertine stone, the silver-grey basin is rough carved with polished inner faces. It sits on smooth timber joinery accentuating the natural texture of the stone. Exhibition Don’t Move. Improve! Tex-Tonic House 1 for NLA (New London Architecture), London. Compact House redesign of original plan form into an open plan kitchen, dining, living area utilizing every inch of space. Award Finalist RIBA London Regional Awards 2013 with Tex-Tonic House 1 & 2. PMA Bath Filler PMA developed a hyper functional steel faucet from which a miniature waterfall gushes was created after a phenomenal amount of research. The final product fills a large volume bath in well under two minutes at up to 200litres/min, an incredible feat of engineering, not known elsewhere in the UK. Beach House This repeat client commissioned PMA to design their third project; a weekend seafront house in West Sussex. A dual skin is deliberately employed to the facade most exposed to the sea wind. Its void contains a sculptural, straight staircase connecting four storeys, with a pocket of unheated but protected air. The buildings massive, thick wall, all insulated on the outside, ensures a low energy building that cools itself and is heated by the thermal mass. This is backed up by underfloor heating fed by an array of thermal panels on the upper roof surface. Award Finalist 2011 Wood Awards Finalist of the Structural Category. Tortoise Enclosure Highly Commended, Surface Design Awards 2013. Award Winner ‘Best Residential Space Planning’, SBID Awards with Faceted House 1. Mint A London design store, is PMA’s first retail design. It incorporates a new facade, basement, structural glass floor and staircase. It is the latter that is the most important detail. It has a very special flush glazed balustrade and floating rough sawn oak treads, together with a special hand rail that has a hidden inner radius to make the act of descending the staircase more pleasurable tectonic experience. Passivhaus Paul completes training at BRE for Passivhaus with the aim of designing to Passivhaus standards for future PMA projects. Backpacker Hotel PMA’s first architectural project covered in BD. Pitch-Gable House On a complex corner site in a London conservation area, the largest ‘pitched gable’ house is intersected by two smaller house forms at non-orthogonal angles. Gutters and utilities are hidden, providing a clean lined exterior. Frameless windows are kept to a minimum on the street side, opening up at the rear for a large light filled living space. The design is a bold response to the need for sustainable living. The house boasts excellent eco credentials using Passivhaus principles, incorporating solar panels, a ground source heat pump, maximum insulation and grey water recycling; whilst technological features work in tandem with the carbon neutral natural building materials. PMA have re-interpreted the traditional house volume to create a new architectural formal typology. White Oak House Remodeling and refurbishment of a 3 bedroom flat in Hampstead, with one of its main features being the large open plan kitchen, dining and living area. 50/50 in Architecture PMA has maintained since inception its 50/50 balance and is proud of its equal opportunities status. Full team pictured here over the last 6 years. Faceted House 2 A new build three story house plus basement in a London conservation area that is currently in planning. Its faceted facade establishes a balance between its surrounding properties removing any rights of lights and overlooking issues. Multi-Denominational Wedding Pavilion A small hotel group gave PMA the brief of creating a wedding venue for their hotel. The conversation with the client developed a multi-denominational concept which became a building that was a fresh architectural type, which could be consecrated by several religions simultaneously. PMA responded with a concept that is unadorned with specific religious symbology, nor descends from any pre-conceived inherited architectural typologies. The venues potential to cater for the whole event, from ceremony preparation through to the evening celebrations within the hotel, ensures proceedings are self-contained and can remain private. A sense is created that the environment belongs to the couple and all that happens in it, is specially for them on their day. The whole design builds on the sense of procession, framing the process of the couple entering through the two doors, into a place of sanctuary to take their vows, leaving the other side as one. Awards Shortlist New London awards shortlisted with Hovering House. Kazakhstan PMA have recently had their first commission in Kazakhstan for a residential apartment build where their new breed of minimalism has been well received. Linden House Remodelling and refurbishment of a detached 2 storey residential building including the conversion of the existing garden storage at the rear into an art studio. Garden Room House PMA were originally appointed to design a side return extension and solve a long standing planning dispute. The planning issue was resolved by Paul’s bespoke stepped glazing detailed design, which set a new planning president. Paul saw potential on the site for a far greater development area, replacing an existing asbestos garage and connecting it to the house to create a garden. This courtyard, minimally glazed on all three sides and level with the inside, thus becomes in all senses the truest ‘Garden Room’. Eco-Lever Apartments New -build project in Camden, London. Carmel House, California PMA’s first American commission – a house with entry bridge in Carmel California. With bridge-rocking earthquakes from the San Andreas fault line and Carmel’s extremely strict planning code’s this demanding project is currently in development. New-Build Apartment Blocks Live project in London. Post-Aircon House This new build apartment block in Notting Hill, London, is a contemporary, exemplary eco-design. PMA won the long battle against the planners and developer client, who wished to use air-conditioning and mechanical ventilation. PMA amassed a vast volume of research and calculation to justify Facade Ventilator panels, which rule out the need for air-conditioning and mechanical ventilation through their cross ventilation by design. Their significance in ventilation is possible throughout inclimate weather, without reducing security or loss of privacy, or causing disturbance by noise. PMA are currently designing this Code 5 building for construction. Highly Commended at the London Evening Standard Awards with Tex-Tonic House. Africa Nearly Zero Housing Our first commission in Nigeria’s capital for three different housing types: a single house, block of flats and a terrace. The aim is to make use of abundant but disregarded materials, such as stone and tropical hardwood, and cultivate a strategy of passive environmental control and ‘near zero’ energy use. Wood Awards Finalist for Interior Design of the Year with Spathroom. Blackhorse Tower Located on a peripheral site in Walthamstow with close proximity to transport links, Blackhorse Tower delivers high density and mix-use accommodation, responding to current development changes in the capital. The design is a quartet of 30 storey point blocks connected by an open lift. In response to both design and structural engineering challenges due to location, the footprint of the buildings snake across the site to avoid impinging on underground lines. With duplex apartments, a hotel and space as well as retail units, the most innovation design feature is the elevated and cantilevered swimming pool poised between apartment blocks. German Student Housing PMA were commissioned by DREF, as Principal Architect to provide accommodation for 5000 students across Germany in major university cities including Berlin, Kiel, Bremem and Munich. The aim if the project is to apply sustainable design by adapting and remodelling existing redundant and post-war buildings. To coincide with each student residence, a ‘Twenty First Century Student Living Architectural and Interior Design Book’ was produced by the team in-house, as a manual that references a broad range of material specification types and their functionality. UK Property Awards Highly Commended for Best Architecture Single Residence London with Haptic House. Modular Housing After the completion of Student Housing across major cities in Germany, PMA develop their First Modular Housing concept. In response to the shortage of affordable UK homes, the prefabricated housing system is developed in UK based factories as a cost-effective, technically inventive and easily replicable housing solutions. The flexibility of its design is applied to a range of building types such as student, high end residential, commercial projects and hotels. Award Winner Bathroom Design of the Year (Over £15k) at the Designer Kitchen & Bathroom Awards 2017 with Spathroom. Sticke Tennis A commission for the first new Stické Tennis court to be constructed in Britain in over a century. PMA exhaustively surveyed an existing historic building as the foundation for developing a contemporary design that includes a glazed club room outlooking the main court. Battersea Tower Planning Permission achieved Based on a riverside site in Battersea, the proposed design remodels an existing block of flats with the addition of four extra storeys that help to shape the profile of the building and add verticality as well as maximise views and minimise the overshadowing of neighbouring buildings. Pacific Panorama House PMA’s first American commission overlooking the Pacific Ocean in Carmel by-the-Sea, reaches completion. ‘Paul McAneary Architects’ London office has changed the face of their entire street with a Japanese-style facade and some intelligent space solutions, writes Catherine Slessor’. Our office features in an article that highlights how a Japanese facade transforms a London alley. Find out more about the various thought processes and design ideas behind our office by clicking here. The BBC‪ featured Paul McAneary Architects project ‘Garden Room House’ as an example of the highest quality architectural & interior design as ‘Tricks of the Trade’ to inspire the creation of new homes. Check out the clip by clicking on our YouTube channel here. View publications featuring Paul McAneary Architects and our work here. Click on the icon to open the articles. 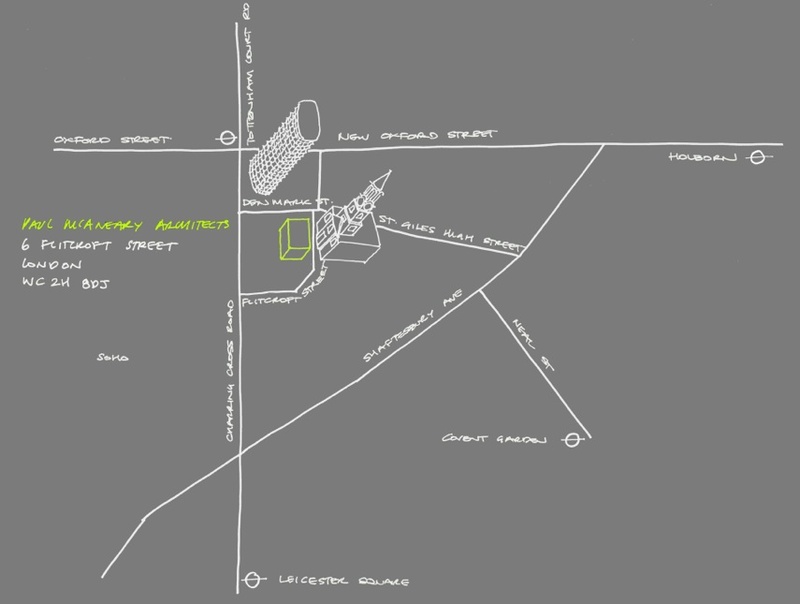 Please click here to access Paul McAneary Architects ftp site (file transfer protocol – website). This is an area for clients and consultants to access live project information. Information here can be shared by downloading and uploading. Consultants are requested to check their upload information is the current revision issue. We recommend accessing FTP site with Safari or Chrome.